Finally a tiny shop update! It feels like it has been forever since I updated my shop with some new goodies. The monkeys always look industries owl breeding program has hit its stride. Two pair of twins and a little short squat wise young’ in. These guys will be in the shop soon. are in the shop. Oh happy day. I am doing my happy dance today. I made my first sale on Esty today. This little girl has found a new home in New York. I know she will be happy there. I packed her with a nice warm coat so she can make it though the winters. I whipped up a little thank you tag with some tea stained paper, some artwork and vintage buttons sewn on. I am excited to announce that I will be selling my wares on August 2! We are having a neighborhood wide garage sale, where I think it will be an excellent venue to debut Monkeys Always Look! I will be selling a lot of potted plans and vintage pieces as well as some repurposed items. 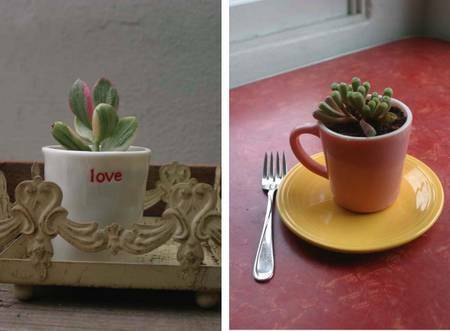 Cute little repurposed pots to add to the your cactus garden. "Blanche I'll take a slice of baby toe cactus with a cup of joe!" 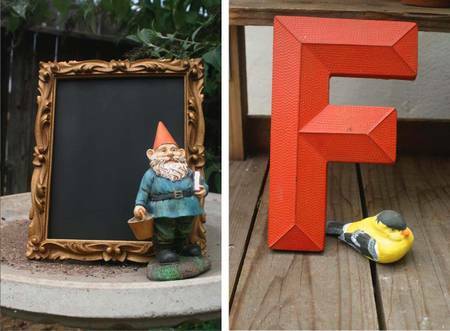 This little Gnome is parting with his little black board and Mr. Chickdee has put his little "F" up for sale.